The development of professionally orientated curriculum descriptors will be a bottom-up process, with input drawn from experienced sign language teachers via our workshop and network meeting, and this will be mapped to content that we will draft on the basis of PRO-Sign 1 work on CEFR descriptors. The development of an ELP for sign languages is also innovative. Our approach offers space for deaf experts to contribute to the process from inception to completion - a rare opportunity when engaging with European institutions. We will draw on our strong network of institutional and NGOs at European and regional level in our work. The direct beneficiaries of this project will be sign language teacher educators and curriculum developers for sign language instruction. Student teachers, teachers and other learners of a sign language will benefit too as we will formulate a Common European Framework of Reference for Languages (CEFR) related framework of competencies and learning outcomes for SL teachers. This framework will form the basis for sign language instruction in sign language teacher education and in programmes where sign languages are taught (e.g. interpreter education). The products will be available via open access, with guidelines to support operationalisation and embedding of outcomes into existing or new sign language programmes. Teachers and learners will be able to access the guidelines and, via the basic ELP, become (more) autonomous learners. The material and assessment resources will ensure that examples of sign language teacher competencies will always be available for benchmarking across Europe. A comprehensive user guide for sign language teaching and learning within the framework of CEFR (with an emphasis on B2). Practical examples of how the existing learning and teaching tools are used in sign language education, including reviews of national curricula (including learning outcomes as well as teaching and learning materials) with an emphasis on B2. Development of European Language Portfolio for sign language learners. A comprehensive analysis of the need for, and feasibility of, a Common European Framework of Reference for Language Teachers (with focus on B2). Enhanced quality of sign language education which meets the needs of all sign language teachers and learners in terms of curricula and materials within the context of CEFR (with special focus on B2). Professionalisation and standardisation of sign language teacher education. Broader awareness of the importance of sign language teaching and learning within the framework of the Convention on the Rights of Persons with Disabilities (CRPD) and within the terms of inclusion. Enhanced awareness of the linguistic and cultural diversity of sign languages in Europe. Acknowledgement of sign language education as an instance of foreign language education. 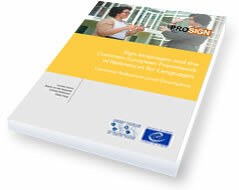 It is a follow-up to the project Sign languages and the Common European Framework of References for Languages. Descriptors and approaches to assessment (ProSign) carried out in the ECML’s 2012-2015 programme. Click here to go to the publication website. How are sign language teachers prepared? What is the impact on sign language teaching? What are the advantages of the CEFR and the ELP? What is the impact of the CEFR and ELP on Sign Language Teaching in Europe? How is the CEFR running in your country? What is the impact of the CEFR on Sign Language Planning and Sign Language Recognition? What has been the impact of the CEFR on sign language teaching at your institution? How has being involved in the PRO-Sign network been of benefit to you in your professional development? The 3rd ProSign Conference will be held at the School of Philology, University of Belgrade (Serbia) on October 19 and 20, 2018. Fore information click here. 7 items found for "Show all items"
Contribution of ECML experts: Thomas Geissler and Christian Rathmann (ECML PRO-Sign II project) will share current work on "CEFR-based sign language assessment: A multistage procedure and error analysis"
Teacher of a national or regional signed language on a university or tertiary level programme that leads to the graduation of students (L2 learners) with a minimum of B1/B2 skills in signed languages (typically interpreter training programmes). Applications from Deaf academics who meet this profile are particularly welcome. •	Didactic and educational expertise. Before: familiarise yourself with the Common European Framework of Reference of Languages (CEFR) documentation (Council of Europe 2001) and with documents provided in English/International Sign relating to the CEFR and signed languages in advance of workshop. During: participate in and contribute actively to the workshop. After: disseminate the knowledge acquired in the workshop and its results in your professional networks. Feb 2017 Promoting excellence in sign language instruction"
In October 2018, the Committee on Equality and Non-Discrimination of the Council of Europe unanimously adopted a draft resolution calling for official recognition of sign languages with a view to enabling deaf persons to exercise their fundamental rights, such as the right to employment, education, access to health services and participation in political life. Recognising sign languages as official languages would also contribute to promoting their use in public institutions, including national parliaments, to preventing discrimination and to further promoting the richness of deaf culture, and would send a powerful message of inclusion to the deaf community. This issue will be debated during the next meeting of the Standing Committee of the Parliamentary Assembly of the Council of Europe (PACE) which will be held in Helsinki, on 23 November 2018. The Pro-Sign pre-conference workshop was held on the 18 October at the University of Belgrade and led by Thomas Geissler (Humboldt-Universität, Berlin) and Dr. Christopher Stone (University of Wolverhampton). The aims of the workshop were two-folds: (a) to develop effective strategies in the field of sign language teaching and interpreters' training in the Balkan countries and (b) to introduce goals of the third Pro-Sign conference in the following days. The Pro-Sign2/efsli conference in Belgrade (19-20 October 2018) was attended by approx. 150 people from 39 countries. Themes were the European Language Portfolio (ELP), Assessment, sign language pedagogy and technology, plans to develop a (generic) sign language teacher training curriculum and of course, sign language teacher competencies – based on work by ECML project Towards a Common European Framework of Reference for Language Teachers. The presentations were innovative, inspiring and challenging, both for established programs and experienced teachers as for new players in the field. The keynote by Prof. Dr. Jelena Filipovic and Prof. Dr. Julijana Vuco (University of Belgrade) titled Sign language in academic contexts from the perspective of language and human rights was impressive in that it painted a painful picture of the status of sign language in Serbia and elsewhere, but finished on an optimistic note about new developments in the deaf community about visibility and participation in the larger communities. Actually, we learned that the rector of University of Belgrade, Prof. Dr. Ivanka Popović and the colleagues in the Faculty of Philology at University of Belgrade plan to include Serbian Sign Language in their program. It is an important step of language planning with the goal to enhance awareness of Serbian SL and human rights of sign language users in the Balkan region. We wish them good luck and all the best for the implementation. In this light, the presentation of a study on Serbian Sign Language by Dragana Raičević, Mihailo Gordić, Gordana Nikolić and Mieke Van Herreweghe (University of Ghent, Belgium) was especially welcomed by the audience. It is an important study for the Serbian Deaf community. Ivana Bucko (efsli) who coordinated and organised the conference, supported by the expert team of ProSign, had inspired about 60 volunteers, students of the University of Belgrade and members from the Belgrade Deaf Community to assist in all kinds of matters, and to provide the participant with coffee, tea and lunches during the breaks. Thank you volunteers! The team members of Pro-Sign2 like to express their gratitude to all who contributed to make the event such a huge success, last but not least the wonderful people at the European Centre for Modern Languages (ECML) who supported us on all levels. We were delighted to have representatives from several of our associate partners with us, including ENSLT and Moscow State Linguistics University. Also thanks to our sponsors: Anéla, Deaf Club Belgrade, ECML, efsli, ENSLT, Hogeschool Utrecht University of Applied Sciences, Humboldt-University zu Berlin, Interkantonale Hochschule für Heilpädagogik, Serbian Association of Sign Language Interpreters (ATZSJ), Trinity College Dublin. Preparations for the upcoming Third PROSign conference and pre-conference workshop at the University of Belgrade, Serbia, are underway. We have been enjoying the close collaboration with efsli as one of our associate partner. Efsli, under the leadership of efsli president Ivana Bucko plays a crucial role for the success in Belgrade. We look forward to discussing our PROSign products with conference participants soon. CEFR workshop ("Minicurso 7: Marco de Referência Europeu para o ensino de Línguas de Sinais: Aprendizagem, Ensino e Avaliação") as a part of TILP conference in Florianopolis, Brazil will be delivered by Christian Rathmann on 1st October 2018. In June, Carmel Grehan presented on work undertaken at the Centre for Deaf Studies around piloting the European Language Portfolio (ELP) with a group of second language learners of Irish Sign Language at Trinity College Dublin. Working in partnership with the Irish Sign Language Academy, Carmel led a one day workshop on how the ELP can be used in the teaching and learning of Irish Sign Language for a group of ISL teachers at Deaf Village Ireland in Dublin. We are proud to announce that we have made available the results of the surveys that were done during the PRO-Sign1 and PRO-Sign2 project of ECML. Sign languages for professional purposes: The implementation of the Common European Framework of Reference (CEFR) for sign languages in higher education - Results of an international survey. And here the link to the Survey report from the ECML project PRO-Sign2 on "Promoting excellence in sign language instructions". Preparations for the ProSign2 / efsli conference in Belgrade in October 2018 are in full swing. The registration for the third PRO-Sign Conference is now open and the preliminary programme has been released; the final programme will be available in August. Information can be accessed on the efsli website or ProSign page. In preparation for the conference, we would like to draw your attention to another ECML project, in which Language Teacher Competencies have been drafted. We invite you to have a look at this information in preparation for our Belgrade conference. Abstracts have been submitted. Further information (programme, registration, location etc.) will be released in early June. A meeting with Ivana Bucko, president of the European Forum of Sign Language Interpreters (efsli) was held end of May. The third Focus Group of e-ELP at Humboldt-Universität zu Berlin was held on Monday, 28 May. The final results will be presented at the conference in Belgrade. e-ELP is one of our goals in Pro-Sign II. Thanks to the initiatives of the Swiss Deaf Association (SGB-FSS), the meeting of Swiss Institutions of Higher Education, Pro-Sign II representatives and SGB-FSS will be held on 10 July 2018. The Pro-Sign team looks forward to a very fruitful exchange. ECML member state Greece will host a training workshop on the Common European Framework of Reference (CEFR) for Greek sign language teachers in late August 2018. Pro-Sign representation will be involved at some point. Mid-June, the Dutch Pro-Sign II expert team member will present an update on Council of Europe and ECML policies to all teachers of the Institute for Sign, Language & Deaf Studies (Utrecht) in preparation of a pilot study to implement the e-ELP (see above). The pilot study will involve researchers, management, teachers and students. Tobias Haug reports that the University of Applied Science of Special Needs Education (HfH, Zurich, Switzerland) has set up a CEFR1 working group to align the existing Swiss German Sign Language curricular to the Common European Framework of Reference for Languages (CEFR). The outputs of the ECML "Pro-Sign project - Promoting excellence in sign language instruction" are a very important resource for this process. The working group, led by Tobias Haug, is also in close cooperation with other stakeholders, mostly with the Swiss Deaf Federation. In Ireland, Lorraine Leeson and Carmel Grehan, along with student ISL2 teachers Anita Nolan and Eimear Mowlds, have been working on the European Language Portfolio (ELP) piloting with students at Trinity College Dublin. They have talked with students at three points over the course of this academic year about their experiences of using the pilot ELP and explored their thoughts on its usefulness. At Humboldt-Universität zu Berlin, Germany, Christian Rathmann and Thomas Geissler have been working on the implementation of ELP with the students enrolled in BA Deaf Studies. Two focus groups have been arranged, and the experiences were shared. Moreover, the team at the Humboldt-Universität zu Berlin has been working on sign language assessment in three areas: production, reception and interaction. Another focus group has been arranged as well. Colleagues at both institutions are analysing the data to prepare for the Pro-Sign II network meeting in Graz (Austria, 5-6 April 2018). The project team is very much looking forward to telling you about our progress at the network meeting! The Sign Language Curriculum in Deaf Studies at Humboldt University, Germany, was revamped and is now aligned with the CEFR. Third, the preparations of the Pro-Sign Conference in Belgrade, Serbia, include the release of a "Save the date" announcement, and the call for papers will be distributed soon. In Toronto, Canada, a CEFR workshop has been delivered by Christian Rathmann (21-24 February 2018). Beppie van den Bogaerde represented the Pro-Sign II expert team at an EALTA organised event, VIth EALTA CEFR SIG in Dublin, Ireland, on 27 January 2018, “The CEFR Companion Volume with new descriptors: uses and implications for language testing and assessment”. A report will be published soon, drafted by Prof. Dr. David Little. The 3rd PRO-Sign Conference will be held at the School of Philology, University of Belgrade, Serbia, on 19-20 October 2018. A call for proposals and further details will be announced in March 2018. The project is developing a professionally-oriented competency framework for sign language teachers and will provide B2 level materials and learning activities from different European sign languages. They will also create a European Language Portfolio (ELP) that takes account of any modality specific requirements for sign languages. In December 2017 the Expert Team suggested names to the ECML for the PRO-Sign 2 Network meeting, which is planned on 5-6 April 2018, in Graz, Austria. Ten people will be funded to attend, but more are welcome at their own costs. The preliminary program will follow soon, so keep an eye on this website! The first announcements and invitations will be sent out by us and ECML in January 2018. Beppie van den Bogaerde (PRO-Sign 2 Expert Team member) attended the ECML Think Tank in Graz, Austria, on 18 and 19 January 2018. The topic of the Think Tank was Language Learning Pathways. More information to follow next month. Data on how student learners of a sign language reflect on SL learning is currently being collected in Germany and Ireland, where the PRO-Sign 2 team are piloting the European Language Portfolio. Watch out for more information on what students think later this Spring! Tobias Haug obtained a master’s degree in Language Testing (distance). His dissertation is titled Development and Evaluation of Two Vocabulary Tests for Swiss German Sign Language (2017). By the way, he passed "with distinction"! Congratulations from all of us! We are very proud to have him in the Expert Team of PRO-Sign2. Christian Rathmann delivered two talks in Budapest, Hungary, on 9 November at the 3rd International Conference of the World Federation of the Deaf with the theme Full Inclusion with Sign Languages, and he talked about ‘Language Choices in Deaf Infants: Advice for (Hearing) Parents’ (a joint talk with colleagues). He also presented in London, UK, on 10 November 2017, at the ESCR event at City University, Go See: Learning British Sign Language: Bridging Research and Practice. The title of his presentation was ‘Current Issues in Second Sign Language Research’. ProSign and CEFR for Sign Languages have been mentioned and discussed. The Expert team members are involved in the Implementation of European Language Portfolio (ELP) for Sign Languages as a pilot project at Trinity College (Leeson) and Humboldt-Universität (Rathmann), which have already started. Zürich (Haug) and Utrecht (van den Bogaerde) will follow soon. Preliminary pilot results will be presented in our Network meeting in April 2018. Maria de Monte (ISSR, Italy), Felipe Venancio Barbosa (Brazil), Tobias Haug (Switzerland) and Beppie van den Bogaerde (Netherlands) organised an EALTA subsidized event titled ‘Assessing Sign Language in Clinical and Classroom Environment: Learning from Experience Exchange’, in Rome, 9-11 November 2017. About 30 people attended the event, sign language teachers, language policy makers, students and (clinical) linguists. The focus was on assessing atypical sign language (e.g. patients with psychiatric problems) and on testing sign language in L1 and L2 users. The following issues were discussed during the workshop: Target group delineation and adapting SL testing to their needs, Task development, Test content, Post-test (what do we do with the results of the tests? ), and Provide a bridge between Theory and Practice with access to resources. We evaluated the discussed issues during the workshop (WS) and prioritized them as follows (see Figure 1). We are focusing at the moment on gathering information from stakeholders, and are trying to disseminate the current knowledge. We are also analyzing the results from the PRO-Sign2 survey (which was closed in August 2017). These will be presented at the Network meeting in April 2018 in Graz. Beppie van den Bogaerde and Tobias Haug are preparing, with Maria De Monte from Istituto Statale per Sordi di Roma, a workshop on Sign Language Assessment. This workshop will take place in Rome, Italy, on 9-11 November. More information will follow later. Christian Rathmann had a meeting with efsli President Ivana Bucko in Berlin, Germany on 25 August 2017. Main focus was on preparations for the ProSign Conference in Belgrade, Serbia (which is to be held in October 2018). In Ireland, Lorraine Leeson and Carmel Grehan have secured Research Ethics approval to undertake a study that explores how use of the European Language Portfolio helps L2 sign language learners as they progress on their journey to B level competence. They will report back at the ProSign conference in 2018. We also hope that this protocol will be replicated in a number of other countries in the coming year. Lorraine Leeson will be heading to New Zealand in November to present a keynote address at the “Signs of Professionalism Conference”, reflecting on 25 years of New Zealand Sign Language interpreting, teaching and development. ProSign will feature here! The Council of Europe proudly presented the (provisional) updated version of the CEFR. Have a look at the Companion Volume with new descriptors. Our project PRO-Sign2 is mentioned on pp. 22 and 45. Our PRO-Sign2 Network meeting (invited participants) is to take place in Graz, Austria, at the ECML offices on 5-6 April 2018, preceded by an expert team-only meeting on the 4 April. We are currently considering participants and the programme. The PRO-Sign2 Conference is definitely to be held in Belgrade (Serbia), dates yet to be determined in the fall of 2018. We are busy working on the organisation and content. The expert team members will be quite actively promoting our PRO-Sign2 project at conferences and other gatherings. There will a session on the CEFR for Sign Languages as Second/Foreign Language at the International Conference for German Teachers (IDT conference), in Fribourg, Switzerland, in early August. Both Christian Rathmann and Tobias Haug will report at the conference from the PRO-Sign 2 project. Our team is also busy planning a pilot to introduce the European Language Portfolio into a number of sign language classes across Europe this coming year. Stay tuned for updates! People engaged in sign language instruction who are willing to fill out our Survey PRO-Sign2 are more than welcome: please follow the link below. The survey is open until July 30th next. In August we won’t be reporting on any progress, since we will either be on holidays or attending conferences. The expert team members wish you all a very good summer ! In April and May, we have been working on the glossary, which will be posted on the project’s website real soon. Furthermore, we are trying to find more respondents for our Survey: if you have not filled it out yet, there is still the opportunity to do so. Please go to http://survey.cefr4sl.eu/index.php?sid=57936&lang=en and help us get an overview on sign language teaching curricula and competencies as per now across Europe. From 3-5 May, Tobias Haug has attended the ALTE International Conference in Bologna and also presented the PRO-Sign 2 project within a panel on sign language assessment research. Christian Rathmann has shared information on PRO-Sign I (publication of CEFR for Sign Languages) and PRO-Sign II (focus on the development of teaching and assessment materials and ELP for Sign Languages) with participants at the last Erasmus+-funded Sign Teach project meeting in Siena, Italy, on 5 May 2017. He also met with the representative of the European Network of Sign Language Teachers (ENSLT) in Siena. Additionally, he delivered a presentation on CEFR-based sign language certification procedure at the national Swiss Deaf Association General Meeting in Lugano, Switzerland on 15 May 2017. Beppie van den Bogaerde presented a keynote at the Symposium on Signed Language Interpretation and Translation Research at Gallaudet University, Washington DC, in March/April last. She talked about how research is interwoven with the implementation of the CEFR aligned new curriculum in her institute, which was driven by her work in ProSign I. This workshop brings together 34 teachers of a national or regional signed language on a university or tertiary level programme from 28 countries (member states of the ECML and Russia, Canada) and is moderated by the PRO-Sign team. The professional development workshop also focuses on the elaboration of concepts and materials and provides a great opportunity for the participants to improve their knowledge of CEFR-based development of instructional materials; to work with the European Language Portfolio (ELP) in Sign Language teaching and learning; to use a variety of teaching and learning strategies; and to explore innovative ways to offer materials and exercises. The ProSign 2 project, which is a follow-up to the 2012-15 project “Sign languages and the Common European Framework of Reference for Languages: Descriptors and approaches to assessment”, will develop a professionally-oriented competency framework for sign language teachers and provide B2 level materials and learning activities from different European sign languages. The project will also create a European language portfolio (ELP) that takes account of any modality specific requirements for sign languages. Follow the project developments on Facebook (ProSign 2: Promoting excellence in sign language instruction) and Twitter (using the hashtag #ProSign2). In preparation for the workshop, the national representatives from the 33 ECML member states are currently selecting potential participants. Experts from Albania, Bosnia and Herzegovina, Bulgaria, Greece, Liechtenstein, Lithuania, and Montenegro, with a special interest and relevant professional background in this topic, are still warmly invited to make contact with the ECML National Nominating Authority in their country so that they can be considered for participation in this project workshop. The expert team of the project is currently busy preparing the workshop and putting together a challenging programme for the event. Please don’t hesitate to contact them if you have questions or suggestions for input to the workshop. The expert team is very excited about the event and greatly looking forward to working with colleagues from all around Europe ! Become a fan of the PRO-Sign2 project on Facebook ! This resource establishes European standards for sign languages for professional purposes in line with the Common EuropeanFramework of Reference for Languages (CEFR) and provides anoverview of assessment descriptors and approaches. The website contains definitions of CEFR proficiency levels for sign languages, videos in International sign and links to related projects and activities,an assessment cycle for language proficiency in sign languages, ideas for making good use of the CEFR, as well as a glossary. The European Centre for Modern Languages (ECML) is a Council of Europe institution promoting excellence in language education in its member states. The ProSign 2 project Promoting Excellence in Sign Language Instruction aims to raise the profile of sign language (SL) teachers in Europe and to support them in their efforts to achieve excellence in their teaching, both content-wise and didactically. PRO-Sign 2's goal is to disseminate high quality materials aligned to the CEFR (Common European Framework of Reference for Languages) and to facilitate the exchange and strengthening of expertise amongst Europe's sign language teachers to support them in their work and to raise the quality of sign language teaching and learning. We will draw on the work successfully completed in the PRO-Sign project (www.ecml.at/pro-sign, 2012-15) and use this as the basis for enshrining European standards in sign language instruction and learning. The project was launched with the kick-off meeting in Graz, 23-24 March 2016. Our first activity is to conduct a survey - for the first time – to benchmark sign language education pathways for teachers of SLs in Europe and identify barriers to accessing language teacher education for deaf teachers. We will also compile a professionally-oriented competency framework (instruction component). Furthermore we will link the European Language Portfolio (ELP) to the competency framework (learning component) and develop and disseminate CEFR B2 level materials and learning activities for sign languages as an exemplar that brings us beyond A1-B1 level work that is now more widely in place. This work contributes to the understanding that European sign languages are part of the plurilingual tradition of Europe. We will also document competencies required at various educational and/or professional levels for SL teachers, including trainee teachers, , drawing in part on previous ECML projects like EPOSTL & EPOSTL 2, with modality-specific matters also addressed. Take steps to come and join us by getting in touch with the ECML National Nominating Authority in your country and applying to be the national delegate at the project workshop, planned in March 2017.